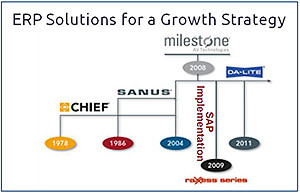 Are your ERP systems antiquated? Problem: Non-scalable business processes and technology are creating inefficient business operations, revenue/margin erosion and poor productivity. Solution: Pragmatek offers deep experience in standardizing business process while aligning and implementing new SAP and Epicor software. This integrated approach leads to the ability to support revenue and margin growth and successful acquisition integration, in addition to improved decision making capabilities. Read how Pragmatek became a trusted partner with Milestone AV Technologies to implement streamlined SAP order-to-cash and plan-to-produce processes that improved productivity and integrated multiple business acquisitions. Non-scalable business processes and ERP systems making it difficult to grow the existing business and have a foundation in place to integrate future acquisitions. Poor Order-to-Cash (OTC) and Plan-to-Produce (PTP) business processes, controls and measurement practices creating inefficient order management, sales support and back-office operations. Improved /streamlined SAP OTC and PTP processes to standardize business practices for existing operations / new acquisitions.